Hortus Camdenensis | Gordonia lasianthus L.
Evergreen shrub, but sometimes growing to a medium-sized tree, with shallowly toothed rounded leaves and axillary white flowers. To 18m. [RHSD, Hortus]. ‘The Loblolly Bay is a native of South Carolina, where it grows in wet swamps. Miller says, that it is with great difficulty preserved in England, and we believe it has not often flowered in the same perfection, as it did last Summer at Mr. Woodford’s, at Vauxhall, where the drawing was taken. It had been turned out of a pot the preceding Spring into a border of bog-earth in the conservatory, which was kept very moist. Flowers in August and September. 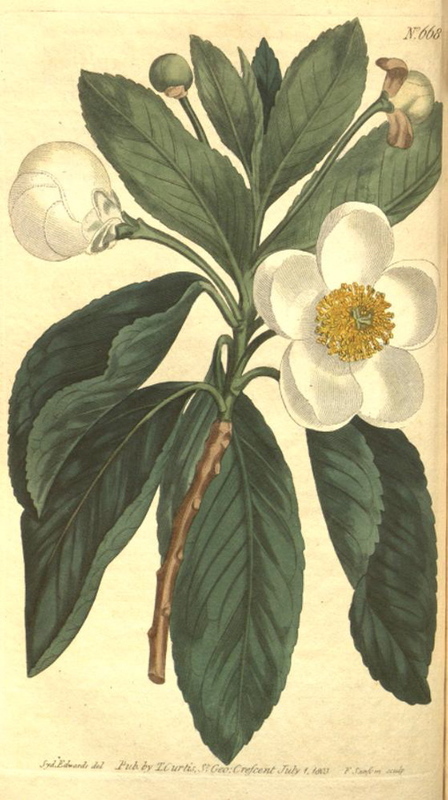 The name of Gordonia was given it in honour of the late Mr. James Gordon, a very celebrated cultivator of rare plants at Mile-End, by Mr. Ellis, who settled the genus from a specimen which flowered at Benjamin Bewick’s, Esq. at Clapham, in the year 1769. It cannot be easily propagated except from seeds imported from America. In the Hortus Kewensis, this tree is placed in the class Polyandria; and both Professor Martyn and Swartz agree, that it rather belongs to this class than to that of Monadelphia, in which Willdenow has nevertheless retained it, and in our opinion very properly, as it is there in company with Stuartia and Camellia, with which, particularly the former, it appears to have a natural affinity.’ [BM t.668/1803]. ‘Gordonia Lasianthus is confined to the region adjacent to the south Atlantic and Gulf coasts. The most northern point where it is found growing naturally is in the southern part of Virginia; thence it extends south to Cape Malabar and Cape Romano in Florida, and westward to the valley of the Mississippi River. It is most common in Georgia and east Florida, much less common in west Florida and Alabama, and rare towards the western limits of its range. Gordonia Lasianthus grows in shallow swamps or on moist springy lands, scattered with the Great Magnolia, the Red Bay, the Scarlet Maple, and other moisture-loving trees, through forests composed principally of the Water-gum; or with the Small Magnolia it almost exclusively occupies shallow depressions, often several hundred acres in extent, in the pine-barrens near the Atlantic coast. It is occasionally found in the sandy swamps which border the rivers of the Gulf coast, covered with almost impenetrable forests of the Water-gum, the White Cedar, the Devil-wood, and the Swamp Red Bay. On the poorest pine-lands of South Carolina, usually covered with a dense undergrowth of the Saw Palmetto, Gordonia Lasianthus is sometimes found blooming as a shrub, and on such soils it rarely grows to a height of more than three or four feet or lives more than a few years. Gordonia Lasianthus is never long-lived, and the insecure hold which the superficial roots have in the wet soil in which this tree grows causes it to be blown down easily after it reaches its full size. […] Gordonia Lasianthus was first described by Plukenet in the Amaltheum Botanicum. It was introduced into England about 1768, and is occasionally seen in gardens, although no great success has ever attended its cultivation. It is precariously hardy in the United States as far north as Philadelphia.’ [Sargent – Silva of North America vol.1, p.41/1891]. Introduced to Britain in 1739. [PD]. Desideratum to Loddiges’ Nursery on 6th January 1845. [MP A2933-2, p.28]. It is marked with a ‘c’, denoting grown at Camden, in an 1836 Loddiges’ catalogue held at Camden Park. This indicates that it was grown in the gardens at some time between 1836 and 1845, possibly lost.